I found myself reminding myself today to notice and savor the “space in between”…We had an incredibly long space in between in the past several months. For months my son was in a mostly stable place, and we thrived as a family. In the past week we have been seeing a quick and steady slide back into a hard place. It’s been exhausting and heartbreaking to once again watch the child we love lose himself to the anxiety and depression. Today was brutal. But in the midst of the ugliness, my boy looked at me and said “Can you just hug me?” – and for a moment everything was right in the world. 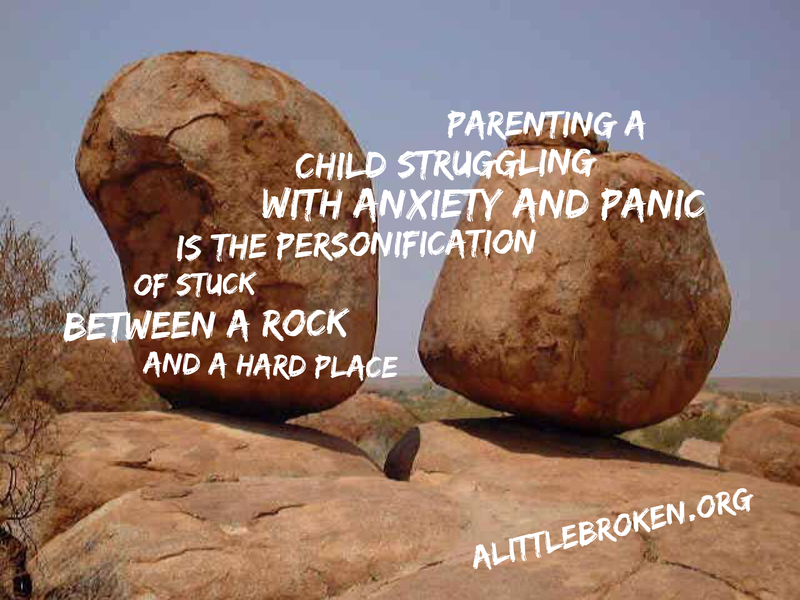 Parenting a child struggling with anxiety and panic is the personification of stuck between a rock and a hard place. Our days are marked not by hours, but by the spaces between anxiety fueled outbursts or shutdowns and panic attacks. We have very little control over the “rock” or “hard place” moments. But I’m beginning to understand that it’s the choices we make and the words we say in the “space between” moments that bring some light into our lives. Today was one long “rock” place. My son had a debilitating panic attack at school on Friday morning and I had to bring him home. This morning, the last thing he said to me when I dropped him off at school was “I hope I don’t have a panic attack today.” So all day I held my breath, and cringed whenever my phone rang.